Be inspired by this beautiful handmade wrapping paper & enjoy wrapping presents for loved ones! Romantic Red Rose leaf paper for a romantic occasion! 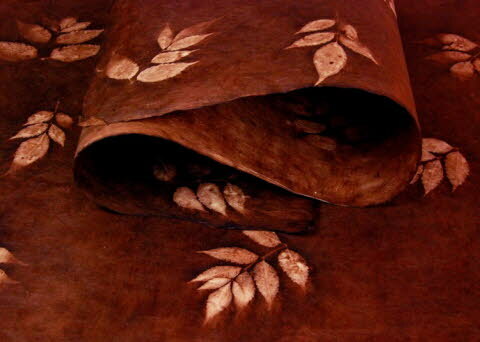 Note: Natural Lokta Tissue paper is now on the Handmade Tissue Paper page (click on the underlined link)! On Facebook? Click on the Wild Paper Like button! Buy handmade lokta wrapping paper folded in 4 to use as a luxurious wrapping paper for special presents, from only £1.65 per sheet! Unsure of the patterns, textures or colours of our printer papers? You can buy labelled mini-sheet Swatch packs or A4 Sample packs for look & feel! For really special handmade gift wrapping, buy our luxurious gold, silver & screen print handmade papers! Buy handmade lokta artists paper - Double Crown poster paper for use by artists and crafts people (or use them to wrap gifts). Our gift wrapping paper handmade in Nepal from the bark of the Lokta bush, Daphne papyracea, is suitable for use by artists and crafts people, or as a beautiful and romantic gift wrap paper for presents. 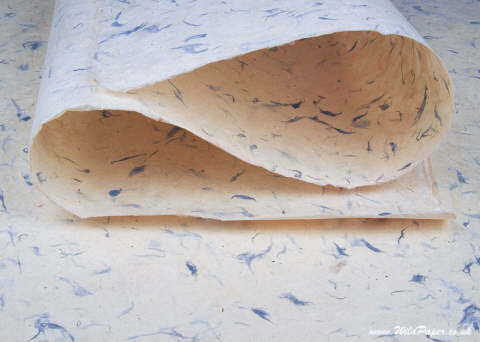 Nepali handmade paper is available as packs of 3 sheets of large, traditionally finished, Double Crown-sized poster paper. Double Crown paper is 30 inches by 20 inches (i.e. 760 mm by 510 mm) and is therefore one and a half times the size of metric A2 paper. These medium-weight handmade artists papers & wrapping paper (100 gms) are made from natural sustainable plant products and come in a range of natural colours. They are suitable for decorative paper crafts including card making and collages, as well as for covering books and photograph frames. 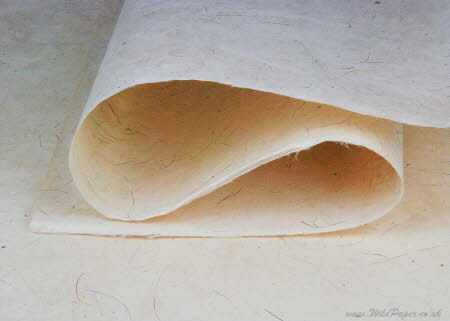 The fibre structure makes this paper suitable for printmaking or batik, as well as for calligraphy, woodcut, linocut and silk screen printing. Some artists also use lokta paper for origami. These sheets are an ideal size to use for wrapping presents, in scrapbooks or even lining a special drawer or shelf. Impress your loved ones with a present that starts with a natural wrapping paper.